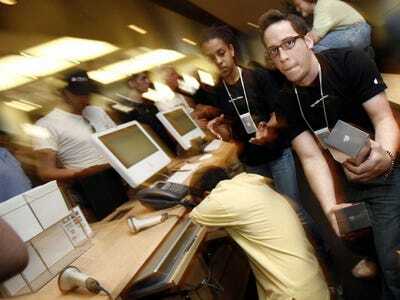 REUTERS/Shannon StapletonIt will be chaos at the Apple Store on Friday. Apple is again likely to hold a Black Friday sale in the UK. Here is a link to the UK Apple Store where the deals will appear. CityAM believes this will be the URL for the direct link to the deals. But that can’t be verified. Apple will most likely get a huge influx of shoppers to its stores and online if previous years’ Black Friday events are any guide. Some seem to think the UK will get price reductions rather than gift cards. This website says discounts are expected on iPads, iPods, MacBooks, and accessories. Apple has already announced its US deals (see them all here), which see purchases rewarded with gift cards. If you buy an iPhone, for example, you’ll get a $US50 voucher. But the company hasn’t yet released its UK bargains. Yahoo Finance also believes Apple might bring actual prices down, noting that iTunes online gift cards, worth more than £25 and bought from Giftcloud, will be reduced from Nov. 28 until Dec. 1. But everything else is purely speculation; nothing is confirmed. The only certainty at this stage is Apple’s work with World AIDS Day. As Macworld points out, last year Apple offered savings of £31 on the iPad Air, while £15 was taken off the iPad Mini price. MacBook Pro models were cheaper by £81, and iPods were also discounted. We’ll keep you updated on Apple’s Black Friday movements in the UK. The Black Friday shopping phenomenon arrived in the UK in 2010, when Amazon first promoted Black Friday discounts to shoppers. Black Friday in the US is the day after Thanksgiving, a day that almost all Americans have off from work — and many use it to begin their Christmas shopping. Black Friday is essentially meaningless in the UK, except that American retailers have figured out that it is a good time to officially get the British Christmas shopping season started. Last year there was a 6.9% rise in shopper “footfall” on UK high streets on Black Friday.